Home » All Forums » [EVGA Graphics Cards] » EVGA GeForce 10 Series » What do you all know about PCI-Express GEN3? Should I enable or leave the feature on auto? Hot!What do you all know about PCI-Express GEN3? Should I enable or leave the feature on auto? What do you all know about PCI-Express GEN3? Should I enable or leave the feature on auto in the system bios? 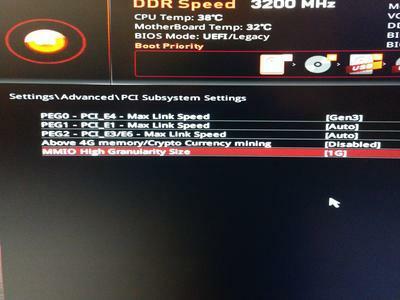 I'm running an MSI Gaming Carbon Pro X299 MB. I've taken some screenshots of the settings for recommendations. 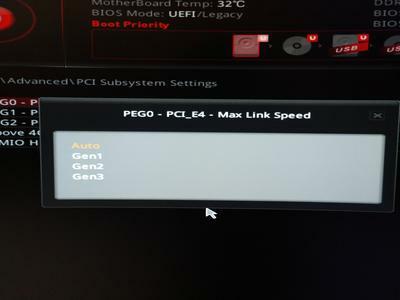 The default settings for PEG0 - PC_E4 - Max Link Speed is set to auto. I'm assuming that it's referencing the very first PCI-E lane top PCI-E lane on the MB? I set it on GEN3 I don't now what the PEG0, PEG1 and so forth even means or if I'm setting them in the correct order to benefit from PCI-E GEN3 for my single 1080 Ti FTW3 or SLI mode. I'm just wondering if I'm setting up the right functions with all these features. I want to squeeze the most I can out of my 1080 Ti's in single and SLI mode. 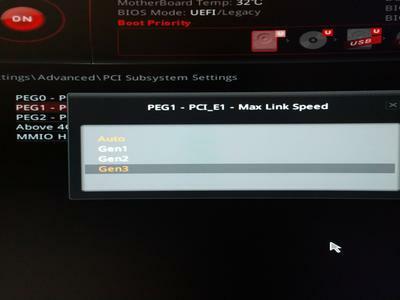 Will it be okay to set all available PEG Link Modes in the bios from auto to GEN3? Sure, just as it is okay to leave it on auto. The only reason to force gen 3 is if a peripheral AIB device wasn't detected correctly. Since you do not have that issue, there's zero reason to change it from the defaults. The more things you change from the default in the BIOS, the more things you need to remember to check if you have issues. So for the record. In single card mode it should look like this. For Dual SLI mode the configuration should look like this. My MSI MB PCI-E X16 slot support is in the First pci-e slot and on the third pci-e slot. Here's the MB layout for pci-e slots. 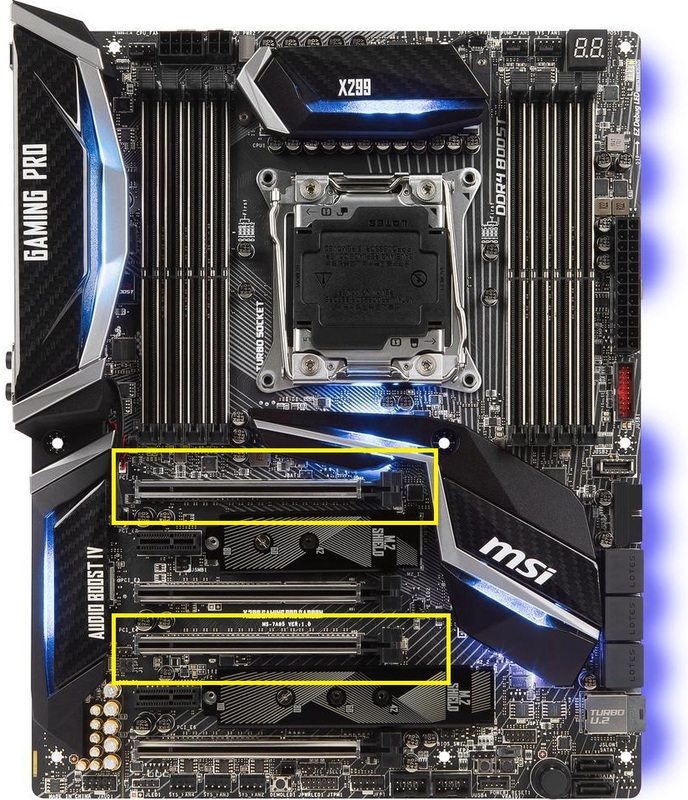 There are four PCI-E slot on the MB. The first one supports 16x and so does the third one highlighted in yellow. Where did you end up Finding the information ? A little birdy by the name of Sajin. Along with contributions from evga forum members. Okay, but 'for the record', leaving them all on auto would be exactly the same. So, to my way of thinking and the manufacturer of the board, they should be all on auto unless you have a need to force Gen3. I assume when you say 'for the record' you're trying to establish some official recommendation to do this. I disagree. There is really nothing to disagree about. You aren't gaining anything by forcing PCI-E GEN3. It's not "good practice" or some "tips and tricks" thing to eek out any extra performance. Sure you can do it just for the sake of doing it but you could also leave it on auto just for the sake of doing it. Lol. Eveyone knows you should set your lanes to gen3 in the bios as running auto could sometimes cause issues. Can't tell if you're being serious or not. I hope you aren't. Of course I'm being serious. In the past I've fixed peoples issues by telling them to run gen3 instead of auto. Really in most cases auto works but it shouldn’t hurt to set to Gen3 on a new video card. My point exactly. You should only do this if people are experiencing issues with their hardware not being detected properly. It’s not recommended to just set it preemptive for no other reason. Yep! I remember on the X79 Platform We Had to Set the Bios to GEN3 and use force-enable-gen3.exe. So sad to see this Forum turn into such an arguing and fighting between Members based Forum. It seems it is no longer a matter what the Question is from the OP is but Members throwing back and forth you are wrong and I am right insults. Who’s throwing insults? Maybe try rereading what has been posted before throwing accusations next time. The fact remains that forcing gen3 arbitrarily for no reason isn’t a recommended standard by any motherboard maker. Exactly. It won't hurt anything, and it will help prevent issues. LOL? You just can't help yourself. Your opinion is not fact nor is yet another of your arguments. You should inform every motherboard maker that they are wrong and they should change the default to GEN3 versus AUTO. Get busy....and be sure to report the LOL you get in response. Forcing GEN3 might cause issues with an older GEN2 card. AUTO is the correct mode according to every motherboard maker despite your LOL opinion to the contrary. Oh, but we aren't talking about a GEN2 video card now are we? LOL. @Sajin but what you’re recommending isn’t the recommended way to set up a motherboard according to virtually any motherboard manufacturer on the market. It also doesn’t help prevent any issues by forcing gen3, if anything it may case issues if for whatever a user decided to use something else in that PCIe slot. Changing things from the default settings in the bios just for giggles just introduces another variable to check in the event something goes wrong and you’re trouble shooting the system. There is really no need or reason to recommenced to people to force gen3 in the bios as a default for no other reason then just for the hell of it. Well we can let the op decide what he wants to do. Of course we can but seeing as you have the title of “moderator” your opinion holds more sway in majority of users and in that regard is why I’m saying you shouldn’t just go recommending to everyone to set something in the bios for no real reason. The op asked me for advice, and I gave it to him. If you don't agree with what I said that is fine, but I stand by what I said. Take it off line or move over and use PM to each other. So sad to see this Forum turned into such an arguing and fighting between Members. I do The Same on all my Rigs. Except I’m not taking anything over I’m simply correcting somethings. I’m not arguing with him or insulting him in any way. I have no bad blood with Sajin I hardly know him. You really need to take your instigating nonsense somewhere else. I’m trying to help here unlike you who is worried about who is saying what to whom. No actually we are still talking about your demand that forcing GEN 3 is the only correct way to set up a motherboard, period. Seems rather silly when you have your your demand stated so starkly, don't you agree? Meanwhile, a professional says you're wrong. Oh well.